PEScience Select Vegan protein reviews aren’t easy to find quite yet as this protein is brand new from one of the top sports supplement companies. But I’m excited to bring you my fresh perspective on this new Vegan protein. I have a ton to tell you and I’m pretty excited to share my knowledge with you. In this PEScience Select Vegan review I’ll tell you which of the three flavors is my favorite. I’ll also tell you what I think of the texture and digestibility overall. The next thing we’ll discuss is what’s actually in PES Science’s Vegan protein blend. What is the key protein source? What are the sweeteners? We’ll go into all that detail. The final the thing we’ll chat about is the packaging. I think sometimes the packaging can be the make-or-break factor for these protein powders so we’ll definitely dive into that. So. Alot to cover. But I’m ready if you are! Let’s get this PEScience Select Vegan Review underway. PEScience is one of those brands you have most likely heard about from some of the big-time Instagrammers that you follow. Well. That’s not true. Mostly just ONE instagrammer that you follow- Amanda Bucci. I think she’s the ORIGINAL fitness influencer. A trillion followers make her one of the all time most favored fitness personalities and it’s not surprise that the rise of PEScience has gone hand-in-hand with Amanda’s. Where am I going with that? Well. I’m not really sure. But sometimes I think that the PEScience products don’t quite mirror the popularity that they’ve gained from their golden goose. (Not that you’re a goose, Amanda, I actually adore you LOL). But. Let’s dive into these products. I actually was able to scoop up all three flavors in little 7 serving containers from bodybuilding.com so I didn’t even have to break the bank in my review. Here is how I would rate the flavors of PEScience Select Vegan Protein. What is the Best Flavor of PEScience Select Vegan Protein? I tried all four and can say with a great deal of certainty which is my favorite and which is my least favorite. In fact why don’t I list out each of these four and describe them. I’ll start with my most favorite and we’ll work our way down the list. Chocolate Bliss: It’s so weird that the BASIC chocolate bliss flavor of PEScience Select Vegan Protein was the one that I enjoyed the most. Now. You’ll see that part of this was because of how BAD two of these flavors are, but it’s sort of a surprise that the regular chocolate beat out the peanut butter version. The PEScience chocolate bliss flavor had a nice chocolate flavor that was actually quite balanced. There was a good bit of real chocolate flavor and I thought there was less of a ‘pea’ flavor than came across in some of the others. Wild Berry: The wild berry PEScience Vegan protein flavor was the only other drinkable flavor in my opinion. My friend Aaron also tried these with me and liked the Berry and Chocolate Bliss as his top two as well (he actually had the bliss second behind berry), but this flavor was okay. I got some strawberry flavors and some cherry I think, but the vegan protein flavors started to overwhelm this flavor as I continued to drink it. Peanut Butter Delight: It’s literally sacrilegious for me not to enjoy a chocolate peanut butter flavor but seriously this one was atrocious. I don’t know how PEScience couldn’t figure out this flavor better than this. I thought it was very ‘peanut-ey’ but not in a good way. This one tasted the same way those fake powdered peanut butters taste. Which is bad. This was such a bad flavor it was like pea and brown rice mixed with cheap powdered peanut butter. Overall I thought two of these PEScience Select Vegan flavors were DRINKABLE but nowhere near as good as several other of the Vegan proteins I’ve tried. I’ll give them a 7/10 on flavor. Let’s discuss the formulation now. Another important aspect of these protein powders are the macros and the ingredient list. I think this protein is surprisingly basic given the size of the company that made it. The macros are pretty standard and I’ll list those out for you before talking about the PEScience Select ingredients. Pea Protein and brown rice are the most common vegan protein sources in these vegan protein powders, so it comes as no surprise that they are the primary ingredients in this protein powder. All ingredients after that are simply used for flavoring purposes. While some will appreciate how FEW ingredients are in PEScience Vegan protein powder- I actually have to go the other direction here. I think PEScience needed to include more ingredients. Some companies can get away with only including a few ingredients in their protein powder, but PEScience’s Vegan protein tastes pretty bad for the most part. They could’ve BENEFITED from including more flavoring ingredients. So. Yeah. It’s an OKAY formula but it’s not a GREAT formula because at the end of the day the product doesn’t taste good. Let’s discuss the packaging now. PEScience Vegan Protein Looks Too Plain. 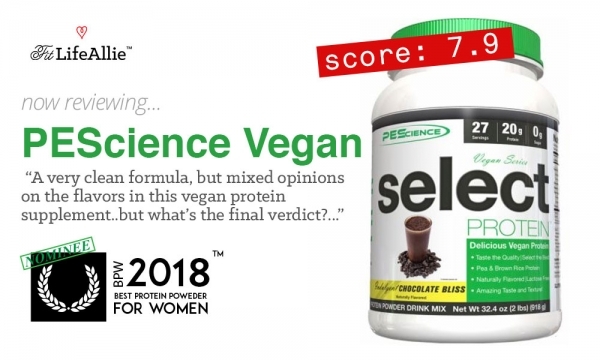 PEScience Vegan Select Protein looks, more or less, exactly like their non-vegan cousins, the regular PEScience protein, which I’ve reviewed a million times. This protein however, doesn’t necessarily do the trick for me. And here’s why. Even though PEScience’s regular designs DO look pretty good, they just don’t look good when retrofitted in a Vegan theme. There is just too much of year 2000 in this design. I know that won’t make sense to some of you, and it is a vague way to capture what I’m saying, but at the end of the day that’s the truth. PEScience’s branding as a whole desperately needs to be spruced up. The graphics lack any creativity or playfulness. They lack anything that tells me this is a Vegan protein, and despite the green accents, I just don’t get that ‘crunchy granola’ vibe from this protein powder. And so for that reason primarily, I have to give PEScience’s Vegan protein a lackluster score of just 7 on packaging.